Miller is 4 years old and a beautiful male Lurcher who is good with other dogs and loves to zoom and play. 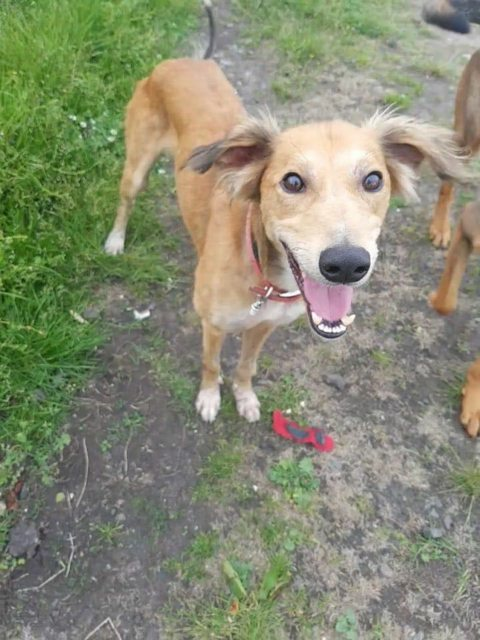 Miller is very light footed and is quite good at jumping – in fact if he sees you are just over there, he will pop over the gate to come and say hello – so a home with a secure, Lurcher proof garden would be a good bet! Miller has probably been kept outside judging from the state of his skin when he arrived so he might need a little time to help settle in a home, but he is a very sweet natured, loving and affection little boy who loves to be loved, so we are sure he will flourish with the right owner. Security is key though! He is at our kennels in Shrewsbury so you must be prepared to travel there to meet and spend some time with him, bringing any other resident dogs with you too so that we can be sure everyone is happy together – this gorgeous young man deserves the very best opportunity now as he clearly has not been spoiled in his previous life. Can you be the one to offer him a Fabulous Furever Home please?